Map of the Coast of Maine (Eastern Part). 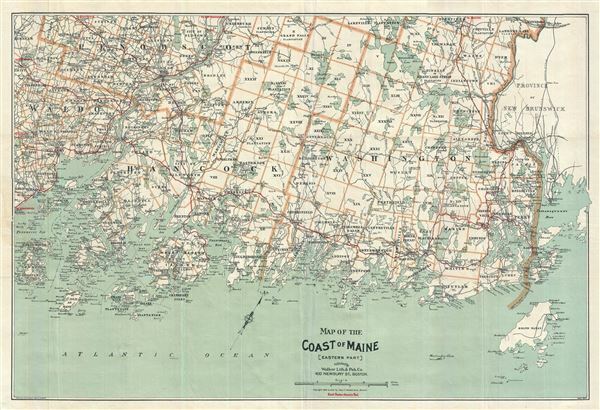 This is a scarce 1910 map of the coast of Maine by George Walker and Company. It covers the eastern coast of Maine from Grand Manan Island west as far as Penonscot Bay and Vinalhaven Island and north as far as Vanceboro. The map shows extensive detail throughout noting cities, towns, islands, bays, rivers, roads and several other important geographical features. Best routes are shown in red. The map was first copyrighted in 1893 and later in 1905 by Geo. H. Walker and Company. This is the 1910 edition copyrighted by the Walker Lith. and Pub. Co. at 400 Newbury St., Boston. Very good. Minor wear along original fold lines. Some edge damage along left margin where map was attached to binder. Accompanied by original binder.